Examination of a stillborn fetus or neonate should consist of a careful and detailed physical examination. You must note the presence of any anomalies, as well as detail size and gestational age. 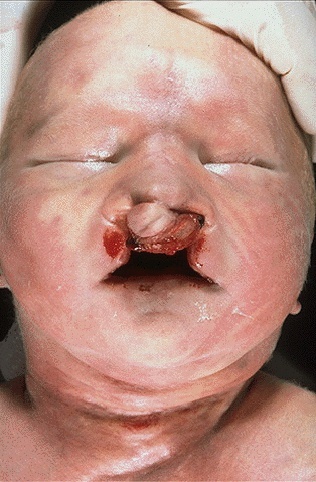 The anomaly seen in this photograph, a large bilateral cleft lip, is not so subtle, but some anomalies are. Call a clinical geneticist for consultation. The presence of one anomaly suggests that additional anomalies may be present, including internal anomalies such as congenital cardiac defects that may be life-threatening.